"Quality is our number one priority." 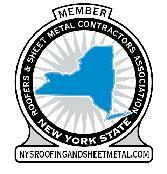 Copper & Slate Inc. is a sheet metal company located in Buffalo, NY. Using traditional practices, we specialize in the fabrication and installation of standard and custom systems for protecting your building envelope. Systems include (but are not limited to) gutters, ice shields, slate, clay tile, copper and metal roofs, flashings and accents. We work also hand in hand with other contractors that do asphalt and flat roofing. This allows us to best address the needs of customers with multi-faceted building envelopes.